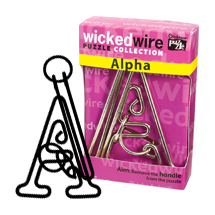 In this next instalment I complete the level 6 (easy) puzzles and start out on the slightly harder (level 7) ones from Livewire puzzles. The last of the level 6 puzzles is the Grand Prix. There are 2 pieces locked together and a ring intertwined with them. I managed to remove the ring in about 30 seconds and was quite disappointed initially. But, like many puzzles the real challenge came in the re-assembly - I thought I remembered the pathway and calmly fed the ring back on, wound it back through the puzzle and my jaw dropped when it just fell straight off the other side! Only after investigating much more closely did I discover the secret and this time it all went smoothly. Repeatability is good because the trick is rather counterintuitive! It is quite a nice movement. Next I tried the Dead end, rated as level 7 and medium difficulty. It is certainly a lot harder than the puzzles I have tried so far and makes me a little fearful about the much higher rated puzzles!!! It looks very similar to a puzzle I already have - the Alpha by Professor Puzzle. The Alpha took me a while but I thought that knowing how to do that one would make life easier. WRONG!! The approach to Dead End is vaguely similar but because of the ring adjacent to the exit it requires different steps - 5 of them in all! This is a nice sequence which is not intuitive at all - it took me 5 to 10 minutes to solve and reversal is just the opposite so not difficult. I think that this is the first one that will stump my friends and colleagues for any length of time. EDIT... I gave this to a couple of friends today and both completely failed at this despite giving it a good go. I then tried to show them the solution and it took me quite a while to work out what to do again! Of the easier puzzles reviewed so far this (and the Sputnik) is by far my favourite! If you are after a small challenge which will not end up beating you then buy this one! Oh, and it looks great too! Next up is the Candy Canes based on Markku Vesala's IPP25 Siamese Twins puzzle design. Apparently Livewire has an agreement with Markku and only a very limited number of Candy Canes will be produced. It consists of 2 candy cane-like structures locked to each other (quite attractive really). It is supposed to be a level 7 (out of 10) and I personally think it is easier than that. Opening it took me less than 2 minutes! Putting it back together also was a snap (although I now always pay attention to the exit position). It is actually a pretty pleasing puzzle to look at and will be nice to leave on the coffee table when you have guests - someone is bound to pick it up! "most people, whether experienced with puzzles or not, usually manage to get the string off rather quickly, few remember what they've done, and quickly find that getting the string back on to its starting point is a much more challenging task!" I completely agree - the first time I played with this I just picked it up and started trying to unloop it and ended up with a real tangle! I then spent quite a while trying to repair the mess I had made (a bit like my DIY efforts!!) After this I actually studied it for a while before reattempting it and managed it after about 10 minutes (again via an absolute mess). Having been warned by the website I paid close attention to the exit position and reassembled it in just 2 minutes! Now, having done it a few times something clicked and it can be done in a few seconds - it is actually a pretty sweet movement. Livewire is correct that the inexperienced puzzler may not pay attention at the end. The set-up position to reassemble the puzzle is rather unusual and if not recalled perfectly it will make it not just awkward but IMPOSSIBLE! Despite being simple this has some great possibilities for handing to guests - it will be very frustrating for them when they don't recall what the exit position was! All of these were very enjoyable - my favourites from this group are Dead End and Coiled Again.